Twin 10G Thunderbolt 2 to Dual-Port 10 Gigabit Ethernet Adapter. The 10Gb Ethernet interface every Mac Pro needs. Cool running with a wake-up on LAN feature, this is a truly professional device. With increasing demands for greater data transfer speeds and more bandwidth over shared networks, and with specialized applications such as HD video editing using high-performance shared storage systems, the deployment of 10 Gigabit Ethernet (10GbE) networking has skyrocketed. This high-speed wired networking standard offers ten times the performance of Gigabit Ethernet, the most common wired network connection included with most computers today, and yet, most computers aren't equipped to get you connected. 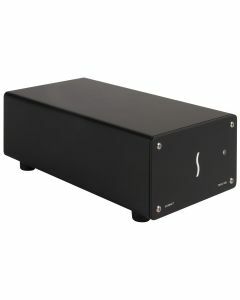 If you have a computer with a Thunderbolt port (Thunderbolt 2 port required for Windows compatibility), Sonnet has a simple solution—the Twin 10G. This Thunderbolt-certified for Mac® and Windows, 10GBase-T adapter is a powerful and cost-effective way to add 10GbE connectivity to your setup. The Twin 10G is equipped with two RJ45 and two Thunderbolt 2 ports. Using RJ45 connectors, the Twin 10G is able to connect to 10 Gigabit infrastructure via inexpensive CAT-6 or CAT-6A copper cabling at distances up to 55 or 100 meters, respectively. Through one of its two Thunderbolt 2 ports, the Twin 10G connects to your computer through an included Thunderbolt cable; the second Thunderbolt port supports daisy chaining up to six devices to a single port on the host computer. The Twin 10G is a striking example of form following function—this adapter's attractive and rugged aluminium housing is engineered to effectively dissipate heat. Together with a temperature-tuned, ultra-quiet fan to quietly cool the components inside, this design enables the Twin 10G to be used comfortably in noise-sensitive environments. Measuring just 4.9" wide x 6.3" long x 2.7" high, the Twin 10G takes up little space. The Twin 10G is easy to set up. To keep things simple, you configure its settings through the OS X® Network control panel or Windows Device Manager. When you configure the device, you can also activate its advanced features: link aggregation (teaming) of its two 10GbE ports increases throughput beyond what a single connection can sustain; transparent failover between 10GbE ports keeps your computer connected in case a single cable is disconnected or one of the ports fails; jumbo packet (jumbo frame) support can increase throughput and reduce CPU utilization; and Wake-on-LAN support enables remotely waking your computer when you need it, and not wasting energy when you don't. This Sonnet solution is perfect for high-performance computing where low latency, high bandwidth, and low CPU overhead are required. Its increased throughput performance and low host-CPU utilization are achieved with stateless offloads, allowing your computer to perform better while large files transfers or high I/O operations take place. The Twin 10G incorporates mounting points to support firm attachment to our xMac™ Pro Server and RackMac™ Pro rackmount enclosures for the new Mac Pro. The adapter is secured to the inside of the enclosure, thereby enabling 10GbE connectivity for the Mac Pro via a separate Thunderbolt 2 port for maximum bandwidth without taking up a PCIe slot or requiring extra rack space.